1908. A humerus from the middle Eocene of the Geisel Valley (MP 12; Mayr 2002a) was assigned to A. broweri by Peters (1998), but was named A. germanicus by Mlikovsky (2002), who did not sufficiently justify this action. 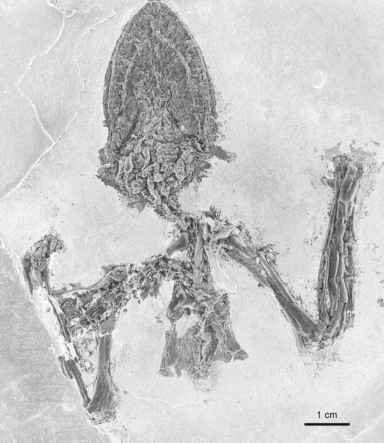 The alleged swift Cypseloides mourerchauvireae Mlikovsky, 1989 is a junior synonym of A. gallicus (Mayr 2003d). Olson (1999a) assigned a tarsometatarsus from the early Eocene of the Nanjemoy Formation of Virginia to the Aegialornithidae. This specimen is stouter than the tarsometatarsus of Aegialornis and was assumed to be a representative of the Parvicuculidae (Sect. 11.7) by Mayr and Mourer-Chauvire (2005). All major limb bones of aegialornithids are known. The humerus is less robust than in crown group Apodiformes, and there is a well-developed dorsal supra-condylar process on its distal end (Fig. 12.8). The ulna is short and stout, but also less so than that of extant Apodiformes. The fenestrated proximal phalanx of the major wing digit bears a well-developed internal index process. The Aegialornithidae were considered by earlier authors (e.g., Harrison 1975b, 1984b; Mourer-Chauvire 1988b; Karhu 1988, 1992) to be either closely related to the Hemiprocnidae or transitional forms between the Hemiprocnidae and the Apodidae. These hypotheses were, however, largely based on overall morphology and have not been well established. Plesiomorphic features which support a position of aegialornithids outside crown group Apodiformes include the morphology of the sternal articulation facets for the coracoid, which are not saddle-shaped or slightly convex as in crown group Apodiformes, the proportionally less abbreviated humerus, and the more strongly developed cnemial crests of the tibiotarsus (Mayr 2003c). Primapus lacki from the early Eocene of the London Clay is known from humeri only (Fig. 12.8). The species was already assigned to the Aegialornithidae in the original description (Harrison and Walker 1975), and shares with Aegialornis the presence of a well-developed dorsal supracondylar process. Being much smaller than the late Eocene Aegialornithidae, P lacki indicates that there was a size increase in the evolution of aegialornithids. I agree with Olson (1985, p. 135) that the alleged cuculiform Procuculus minu-tus Harrison and Walker, 1977, which is based on the distal end of a tiny tarsometatarsus from the London Clay (Fig. 12.8), represents an apodiform bird, and this species may be a junior synonym of P. lacki.